We won't spend much time on the way these instant actions work, since it is so intuitive: just move your cursor above a message, and click on the corresponding image to perform the action in question - in doubt, hover your mouse pointer above the icon for a couple of seconds, and a tooltip will appear, and explain what the action is. Click on the "Options" button near the top right corner, and select "More options". Next, click "Instant Actions" under Customizing Hotmail (2nd section in 2nd column). To disable Instant actions altogether, uncheck the "Show instant actions" checkbox and click "Save" at the bottom. The downside is that the flag icon is now also gone (you'll need to select emails, and then choose "Flagged" under the Mark as menu). Click on an instant action on the left: then, either choose for it to Move up, Move down, or Remove from list (currently selected action has a blue background). Moving up or down is especially useful since it also allows you to move an icon into the "Show always" category - in other words, no need to hover your cursor above the message to show that icon - just like the "Flag" icon works by default. "Move to" allows you to move messages to a predetermined folder with a single click: select a destination folder, choose one of the 5 colored folder icons, and optionally mark the moved message as "Read" in the process (check that checkbox). "Categorize" lets you assign color codes to your emails based on one of 11 categories, which Hotmail will hopefully let us customize in the future - this may not be new to you if you use Microsoft Outlook, but is definitely a welcome addition to Hotmail! Pick a category, pick a color, and you are done - of course, adding multiple times "Categorize" allows you to add multiple category icons to messages. You can only have 5 instant action icons enabled at any given time (otherwise, you'll get the " not enough room for another instant action... remove one first " error message). If you add the Sweep instant action (which takes its name from the Sweep menu added earlier in 2011), you can choose between "Move all from sender", and "Delete all from sender" - we recommend that you never setup an action to delete all emails with a click - you would still be able to retrieve accidentally deleted messages from the Deleted folder, but it's too dangerous a mistake to risk! The final instant action is to add a junk icon that, with a click, lets you mark an email as spam (i.e., move it to the Junk folder and report the sender as spammer), with a single click - you can still do that by clicking "Junk" in the toolbar at the top, but it's less practical since your eyes are locked on the email you're about to mark as junk. 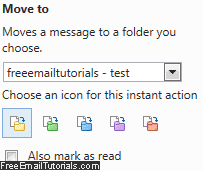 Notice that Hotmail gives you a preview of what a message would look like, with the selected instant actions' icons, when you hover your cursor above it - this also explains whey the Windows Live team chose to currently limit the maximum number of actions to four (4 icons is a crowd). Once you are satisfied with the changes you've made to the default instant actions, don't forget to click on the "Save" button at the bottom of the page!